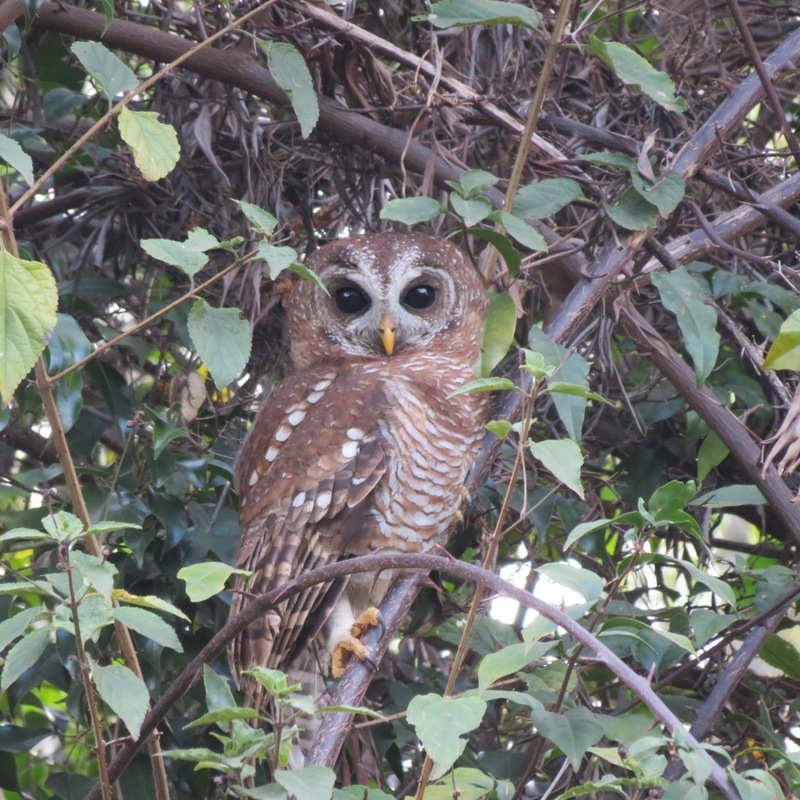 African Wood Owl on its way to roost at “Farm 510” below Mount Meru, November 14, 2014. 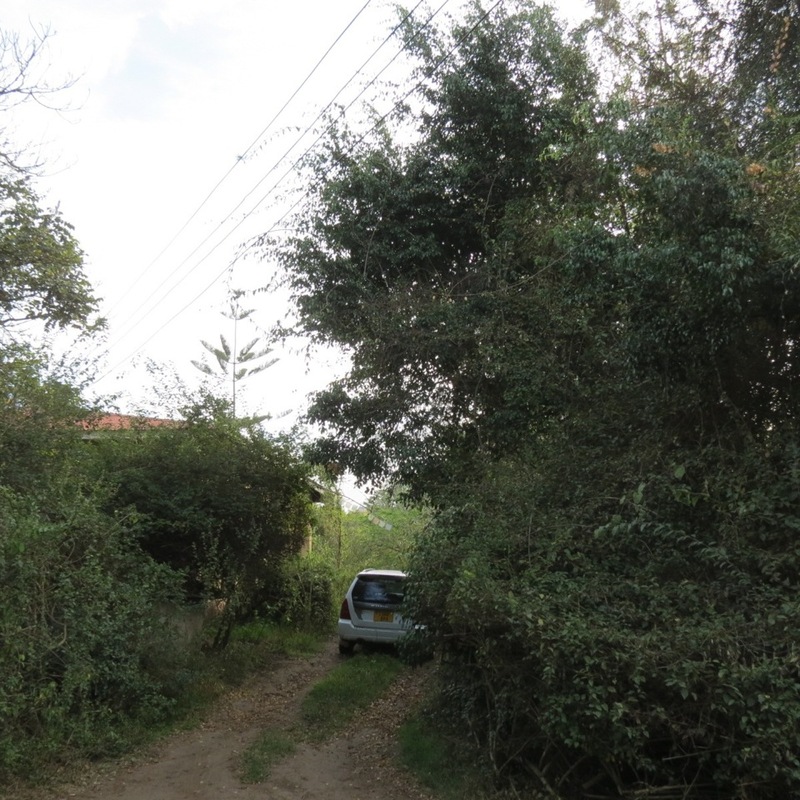 All three leaf species visible are from ‘exotics’, including that dreaded invasive Lantana camara. Zooming-out: African Wood Owl on its way to roost at “Farm 510” today. All four plant species are ‘exotic’: a Javan Weeping Fig – Ficus benjamina, the American Curse of India – Lantana camara, the Brazilian Paper Flower – Bougainvillea glabra and some dead leaves from an Australian Silky Oak – Grevillea robusta. 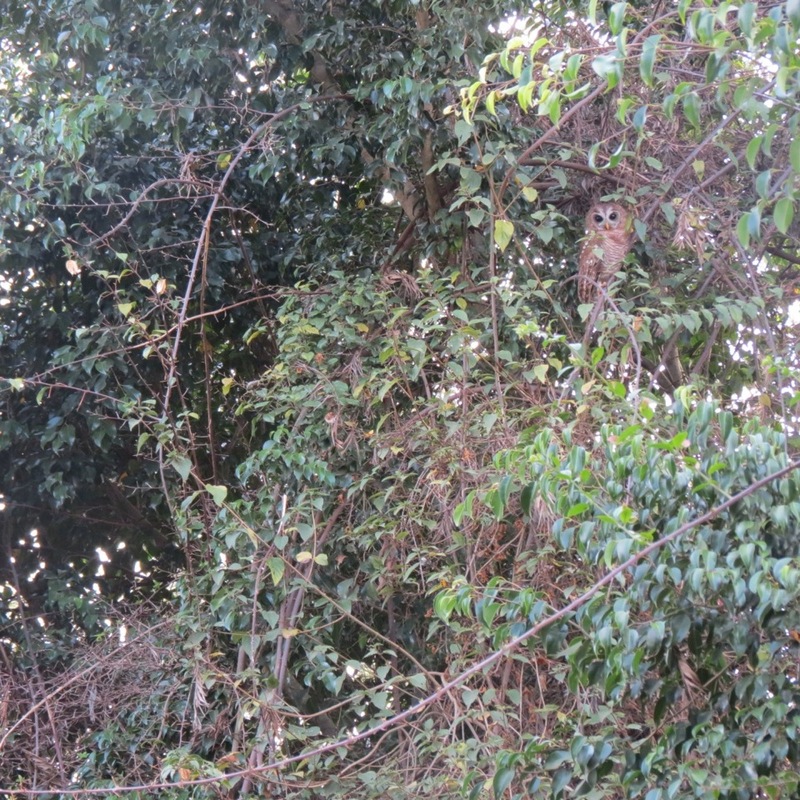 Today’s Wood Owl is still visible – look – can you see it? I wouldn’t have, had it not been for the scolding calls of the Arrow-marked Babblers and the tack-tack-tacking of a Tropical Boubou who has a nest with young in the hedge, and the fluttering of Red-eyed Doves who have a nest just a few centimetres back from where this owl is perched. 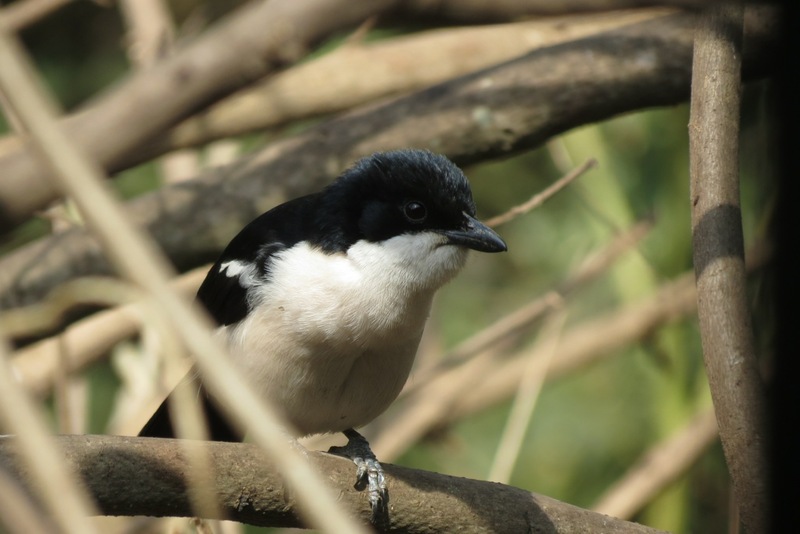 The Tropical Boubou who is nesting near the owl’s secluded roosting spot. Like all the soft-plumed Malaconotidae (the ‘silver-syrinxed’ bush-shrikes, boubous and gonoleks) this boubou is a fearsome predator. Almost daily I find them dismembering mantids, crickets, even geckos that they’ve skilfully wedged in a forked branch or between twigs. Another bush-shrike, this Brown-crowned Tchagra was searching for grasshoppers just outside the bedroom window yesterday morning. At present it is parachute song-flighting at the top end of the garden. 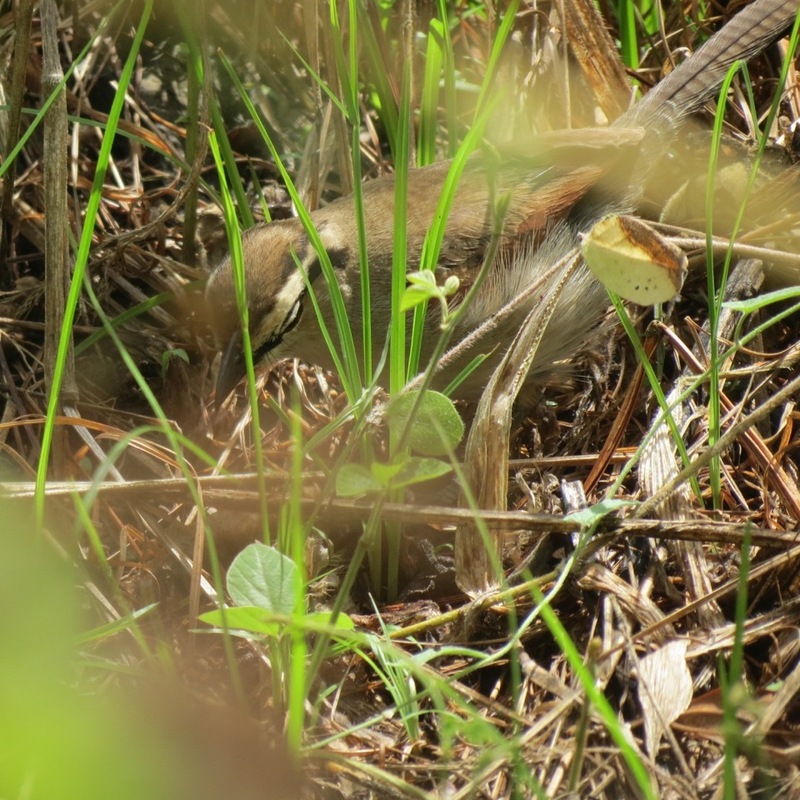 On Saturday we were in the local park – Arusha National Park. Well worth the fifteen quid. 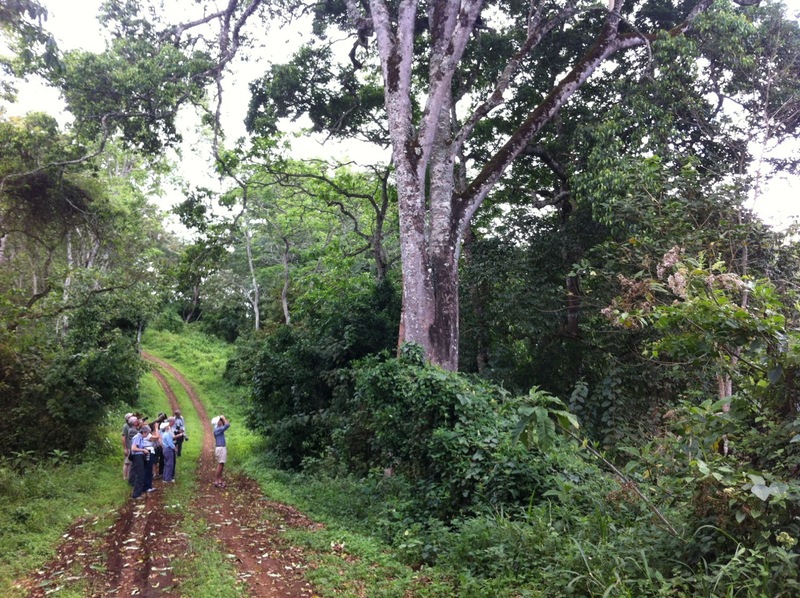 Here a Nature Tek group is observing Guereza Colobus Monkeys, the “flagship mammal” of this small protected area. 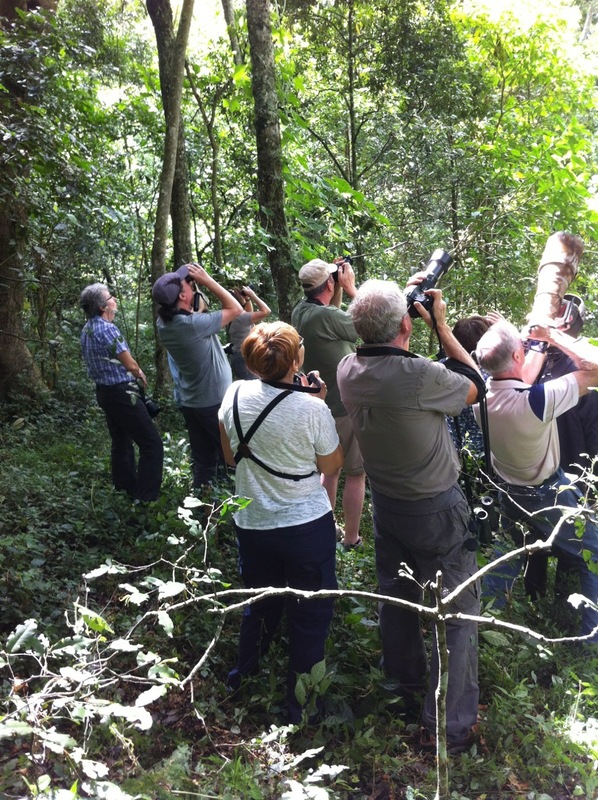 The same tour group last Saturday watching another troupe of Colobus Monkeys this time from a vehicle track which skirts the rim of Ngurdoto Crater, a sanctuary within a sanctuary, yet on the eastern edge of the park above Usa River, a satellite of the fast-growing city of Arusha. 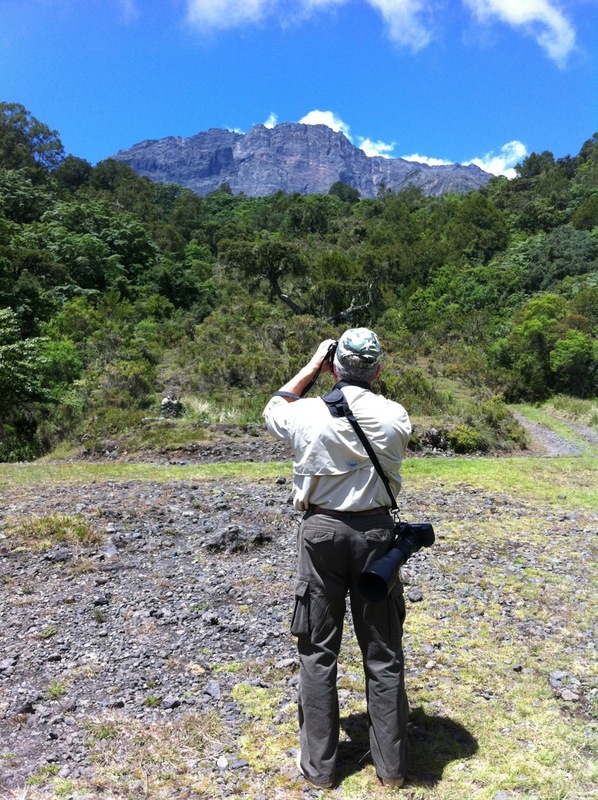 On another tour last week, a visiting ornithologist from Canada watches an African Crowned Eagle, that preys upon primates such as Colobus monkeys, as it displays high over the heath zone and evergreen forest which still clothes Mount Meru’s protected shoulders, those ‘lucky enough’ to be within Arusha National Park. 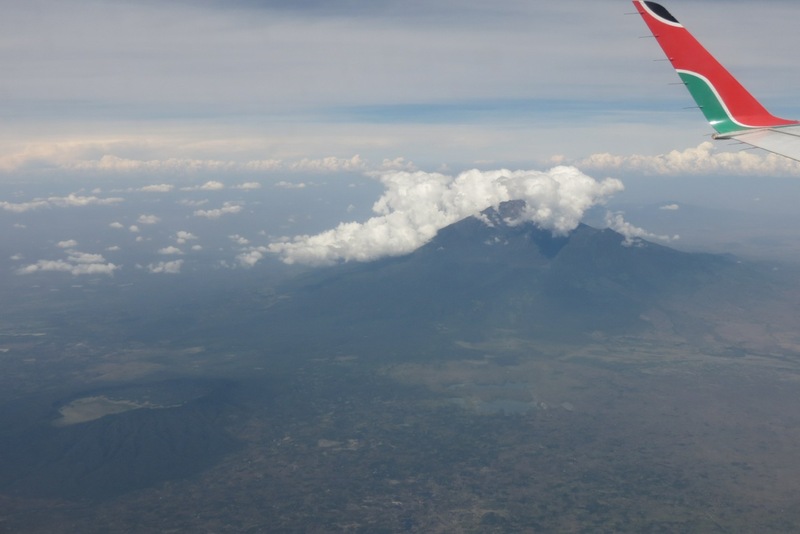 Mount Meru with Arusha National Park’s Ngurdoto Crater clearly visible in the foreground as seen from a flight to Nairobi on February 16, 2013. 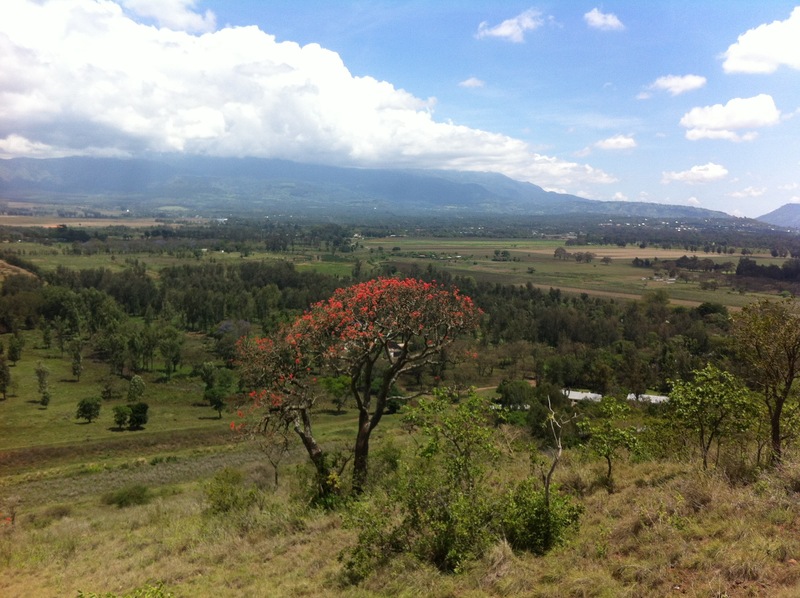 One can see that the forest of Arusha National Park still connects the crater with the wilder mountain. But all around the forest and woodlands have been felled, burned and cleared away to make room for more and more tiny-farm folk who just scrape a meagre living for their families from admittedly rich volcanic soils. 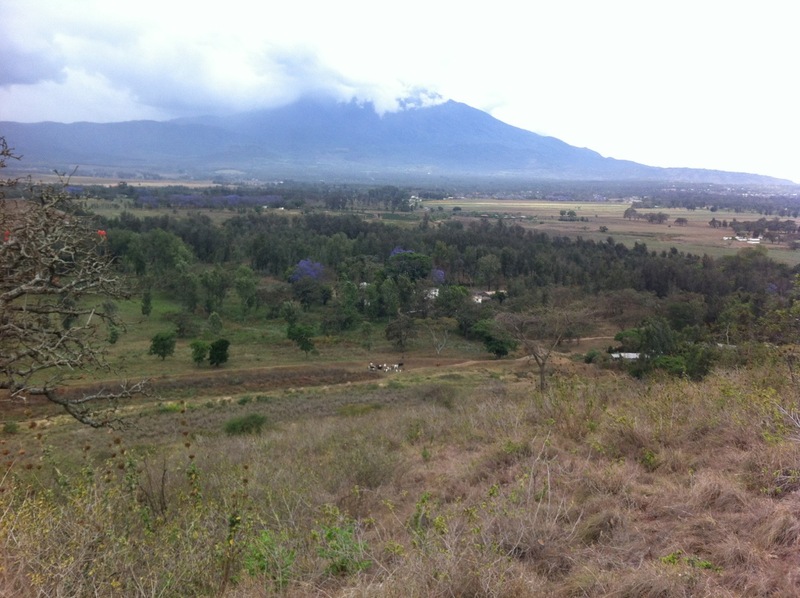 Mount Meru from Magongo hill, which is “on the other side”, photographed on November 1, 2014. Annual rainfall here is less than half of that which keeps the forests of Ngurdoto Crater lush and green. The great variety of habitats, within the “diverse rain shed” that surrounds Mount Meru, still present the naturalist with a highly rewarding landscape, even within the hard-pressed “sell-everything” culture of today. Note the flowers of the indigenous Erythrina (coral red) and the exotic Jacaranda for which blue-Arusha was once famous. The same site on November 22. For the few who may be interested this small, currently rewilding, site support five species of what I call the “social grass warblers” with the crazy names – aka Cisticolas – they are Winding, Rattling, Singing, Red-faced and Siffling!